There is no specific treatment for most of the viruses that affect our pets today and we believe that ‘prevention is better than cure’. Cat flu is still a very common disease, and sadly we also often see cats that have been infected with Feline Leukaemia Virus, a frequently fatal disease. Both of these and many other diseases can be prevented or kept to a minimum just by a simple vaccination. 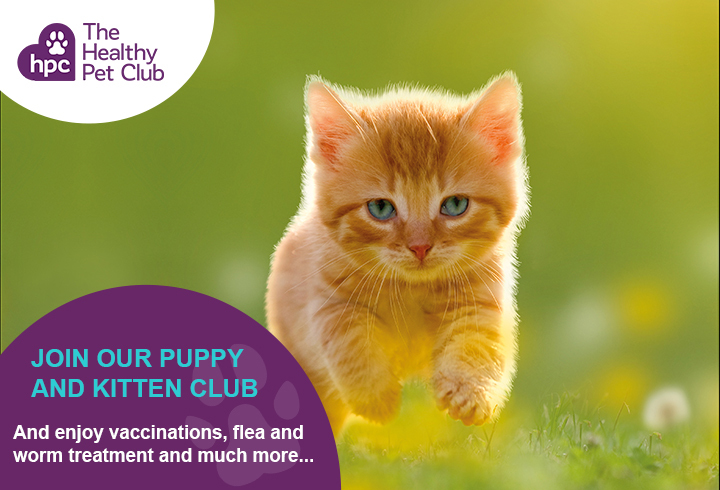 The Healthy Pet Club membership includes your cat’s routine vaccinations. We recommend yearly booster vaccinations to ensure that your cat’s immune system is always prepared in its constant fight against disease. Some of the diseases we vaccinate against (see below) are treatable but some can be fatal which is why we recommend keeping up to date with your boosters to help protect your cat. This virus is the most common infectious cause of death in cats of less than one year. Causes the development of leukaemia (cancer of the blood cells), anaemia, and can even cause cancer of the eyes, kidneys, chest, liver and intestinal system. Virus is found in cat’s saliva and spread by mutual grooming. Symptoms include runny eyes, sneezing, ulcers on tongue, mouth and eyes. Can be fatal in kittens if left untreated. Causes diarrhoea, severe vomiting and is usually fatal. Kittens are most at risk but it can affect adults too. If you have an older cat, it is not too late to start a vaccination programme and your vet will be able to advise you on this. Older cats often have a weaker immune system so it is especially important to give them a helping hand and keep their boosters up to date. Most reputable catteries will not take cats for boarding unless they have an up to date vaccination record. If more than 12 months pass between boosters, your pet may need to restart their vaccination course, as their immunity will have deteriorated. At the time of vaccination, your vet will also give your cat a thorough clinical examination that can alert us to problems ranging from bad teeth to heart disease. This examination is as vital for the well-being of your cat as the vaccination and is a valuable opportunity for you to discuss any concerns or queries you may have about your cat’s health.